SGA elections are quickly approaching, and posters are beginning to plaster campus walls promising a better Pepperdine. The Graphic spoke with the three students running for SGA President regarding their platforms and their hopes for Pepperdine’s future. SGA elections will take place online on March 21 starting at 8 a.m. The election will remain open for 24 hours. 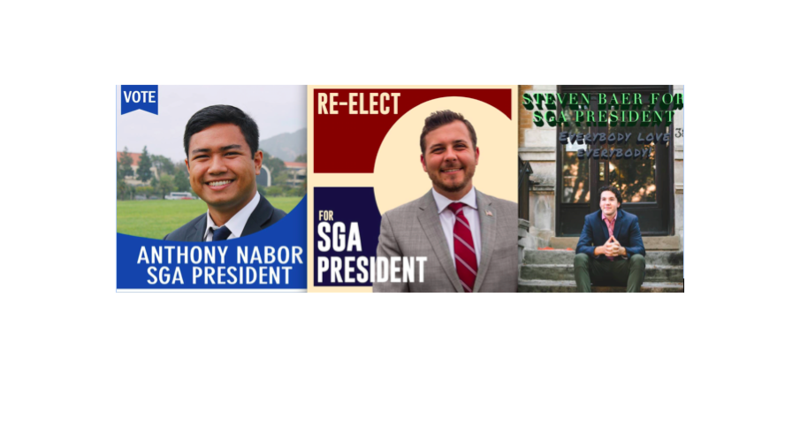 Students will receive an electronic ballet in their student email where they can vote for Steven Baer, Anthony Nabor or Austin Welch for SGA President. Junior Steven Baer is running for SGA president. He’s also couch surfing. In a Facebook post announcing his candidacy, Baer discussed the high rates of on-campus housing and his plan to change it. Baer wrote that he was deeply troubled by the average cost of $6,295 per semester to live on campus. “I cannot help but feel taken advantage of with these absurd rates. That’s not love. If Pepperdine wants to embody the mission of Christ, it must do so in every case, even when it doesn’t benefit their bottom line,” Baer wrote. The Media Production major and Chicago native has spent the past semester independent of on-campus or off-campus housing. He travels through Malibu Canyon on his moped to sleep on friends’ couches and showers at the gym. Baer says he has the means to pay the $14,870 cost of on-campus housing but would rather not. Returning from taking a semester off, Baer found himself the “odd man out” when it came to housing situations. The only option was on-campus housing, but Baer said he was apprehensive. Baer is one of nine children. He attends school on a loan from his parents that is to be paid back post-graduation, Baer said. The expense of living on campus troubled him. Now, Baer is running for SGA President. He says, if anything, he hopes to start a dialogue. “Even if I don’t win, if the other candidates get it in their head that this is a problem then I think I’d be fulfilling my goal,” Baer said. 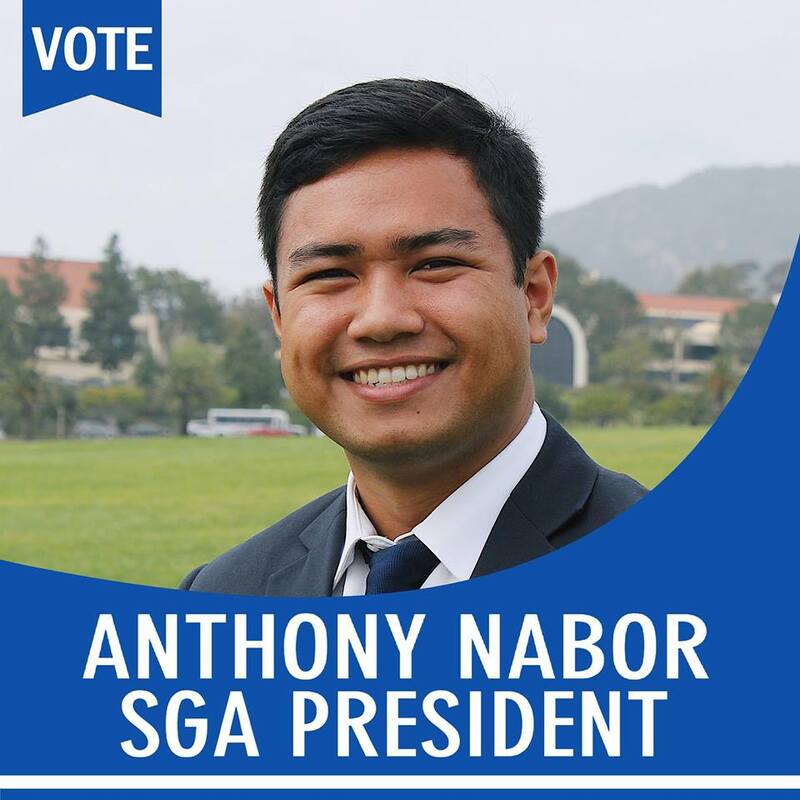 Anthony Nabor is a junior Political Science and Religion major serving in SGA as the Junior Class President. 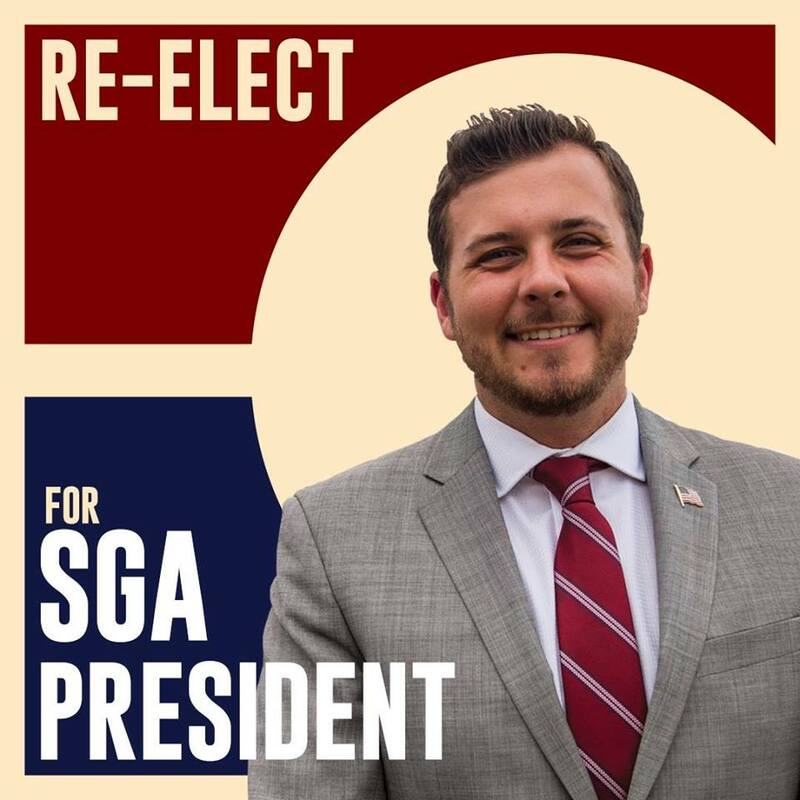 He is now campaigning for SGA President with junior Morgan Bedford who is running for Vice President of Administration. Nabor’s platform addresses many on-campus improvements. He hopes to establish an online SGA archive so students know what their representatives are working on. Nabor also looks forward to improving the shuttle system and parking situation. “We are tired of being told ‘There is already enough parking on campus’ by administration and will make it a top priority to advocate for a solution to the parking problem, especially as Seaside adds 450 new beds without adding parking,” Nabor wrote on his campaign website. Nabor also looks forward to improving the dining services, the Good Samaritan Policy and establishing cultural competency curriculum. 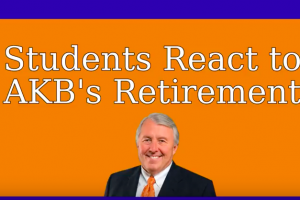 “It is our goal to advocate in favor of incorporating the course into the curriculum without adding to the burden of all the GE classes we already have to take,” Nabor wrote. 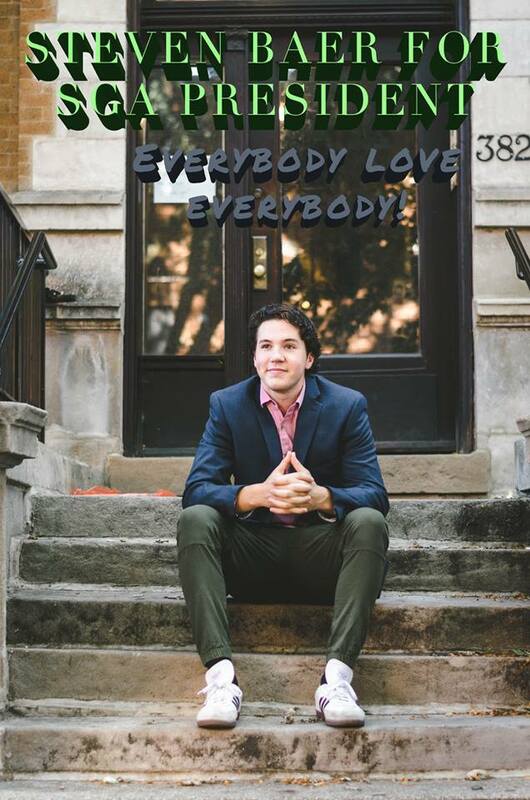 Austin Welch is a junior Business Administration and Political Science major and our current SGA president. He is running for re-election against Baer and Nabor. “This position is not for me, it’s for me to represent the students so I am representing what they want,” Welch said. Welch said he hopes to continue his work on the Good Samaritan Policy if re-elected. Welch sent out a student wide email Monday, polling students on their opinions of the Good Samaritan policy. Welch also said he hopes to encourage the administration to consider other dining options as they enter the final years of their contract with Sodexo. Before serving as SGA President, Welch filled the position of Vice President of Administration. He is also President of Delta Sigma Pi and Chairman for Pepperdine College Republicans. “I am honored and extremely excited to continue serving each and every single one of my peers as I enter my final year at Pepperdine and hope that through my proven leadership over the last three years shown that I am extremely passionate about serving my peers and will do all that I can to make the Pepperdine community the very best that it can be,” Welch wrote in an email.